I made this card for my daughter's birthday last week. She is planning to buy some Annie Sloan paint very soon to uplift some lovely old bedroom furniture.. 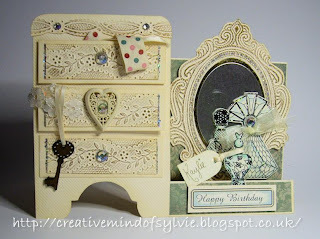 I am loving the Shabby look too! I used my new Anna Griffin embossing borders folders on the 'drawers' and on the top , I rubbed some copper gilding paste over the embossed areas. The beautiful perfume bottles are rubber stamped. Thanks for looking... see you soon. This is the most beautiful card I've seen for ages Sylvie and I'm going to pin it! I love the drawers with the bits hanging out and the mirror is fab:) Your daughter must have been over the moon with it. Absolutely gorgeous card Sylvie and I can tell that Val is jumping up and down with delight after seeing it! It's not often we see her in this state...... Adore the AG embossing folders you've used. I'm sure your daughter was delighted to receive it. So beautiful! This could be a lovely mothers day card...fantastic!